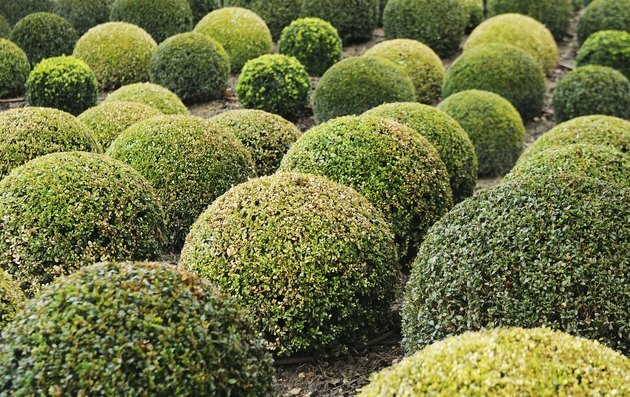 Evergreen shrubs in Tennessee must be hardy in at least one of the state's six U.S. Department of Agriculture plant hardiness zones, four of which predominate. Much of eastern, central and northwestern Tennessee lies in USDA zone 7a, with minimum winter temperatures between 0 to 5 degrees Fahrenheit. Portions of north-central Tennessee and the eastern border the state shares with North Carolina fall into USDA zones 6a or 6b, with minimum winter temperatures of -5 degrees F or sometimes lower. Areas in the southwest and extreme southeast lie in USDA zone 7b, with minimum winter temperatures descending to 10 degrees Fahrenheit. A few small areas fall into cooler zone 5b and warmer zone 8a. 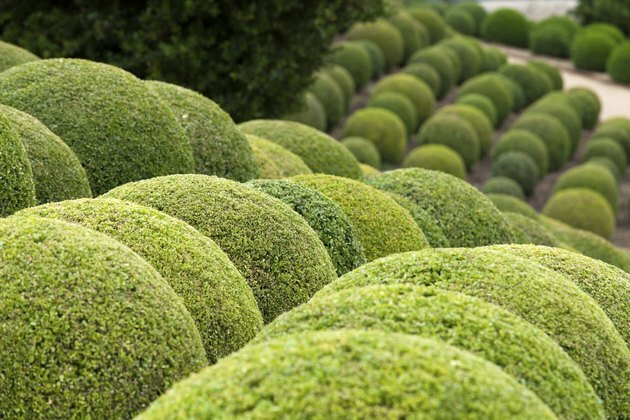 Rows of boxwood shurbs growing in a garden. A flower of a red camellia plant. Some camellia (Camellia spp.) species and varieties are suitable for much of Tennessee and feature broadleaf evergreen foliage along with showy blossoms. Tall Japanese camellia (Camellia japonica), hardy in USDA zones 7 through 9, features glossy, oval leaves and rose-like white, red or pink flowers. 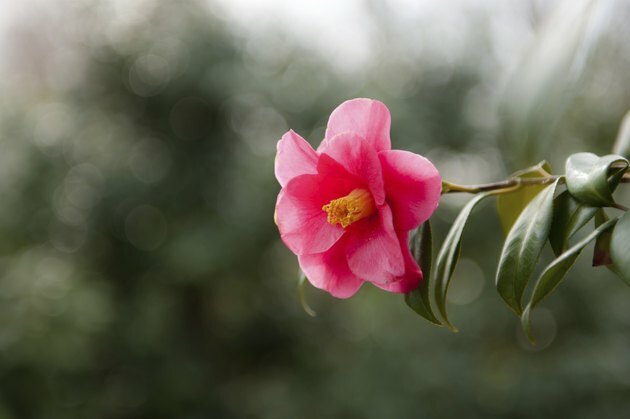 Depending on variety, camellias grow 7 to 12 feet tall and 5 to 10 feet wide. A few varieties, like white-flowered "April Snow" (Camellia japonica "April Snow") are hardy in USDA zones 6 through 9. 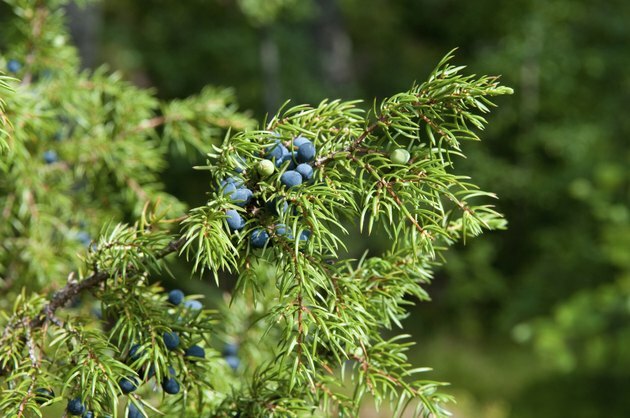 A clump of berreis grow on a juniper tree branch. Sometimes Tennessee landscape situations, especially slopes, call for low-growing evergreens. Some species of juniper (Juniperus spp.) fit the bill. The "Nana" variety of Japanese juniper (Juniperus procumbens "Nana") is hardy throughout Tennessee, thriving in USDA zones 3 through 9. 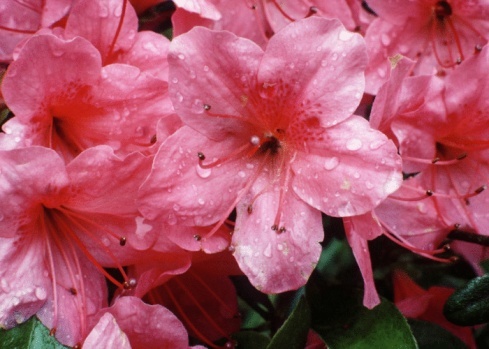 Growing only 6 to 12 inches tall and spreading up to 6 feet, these shrubs do best in sunny sites. Another ground-covering species is creeping juniper (Juniperus horizontalis), hardy in USDA zones 5 through 8, which grows up to 2 feet tall and spreads to 4 feet. Both junipers feature feathery, evergreen foliage. Boxwood shrubs growing in a garden. Boxwoods accommodate the Tennessee climate zones and provide evergreen foliage throughout the year. Littleleaf boxwood (Buxus microphylla) is hardy in USDA zones 6 through 9, with dense, oval-shaped green leaves. Often massed in formal plantings, this boxwood species grows up to 4 feet tall, with an equal spread. For smaller Tennessee landscapes, the littleleaf boxwood hybrid "Green Gem" (Buxus "Green Gem"), hardy in USDA zones 4 through 9, grows only about 2 feet tall and wide, with a mounding habit. It is suitable for both in-ground and container plantings. 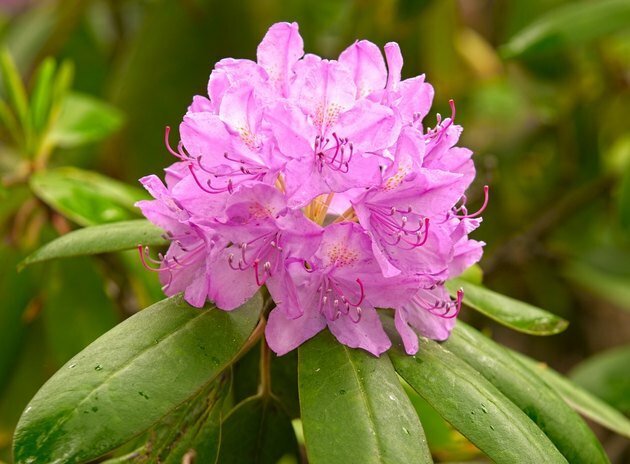 A close-up of a pink rhododendron. Tolerant of heavy clay and shade, spotted laurel or Japanese aucuba (Aucuba japonica) is a broadleaf evergreen suitable for much of Tennessee. Hardy in USDA zones 7 through 10, the plant reaches 6 to 10 feet tall with a similar spread. Female plants also feature bright red fall fruits. Catawba or rosebay rhododendron (Rhododendron catawbiense), hardy in USDA zones 4 through 8, is also successful in its native Tennessee. The shrubs grow 6 to 10 feet tall, with leathery green leaves and large clusters of purple or pink spring flowers. Plant parts are toxic if ingested.